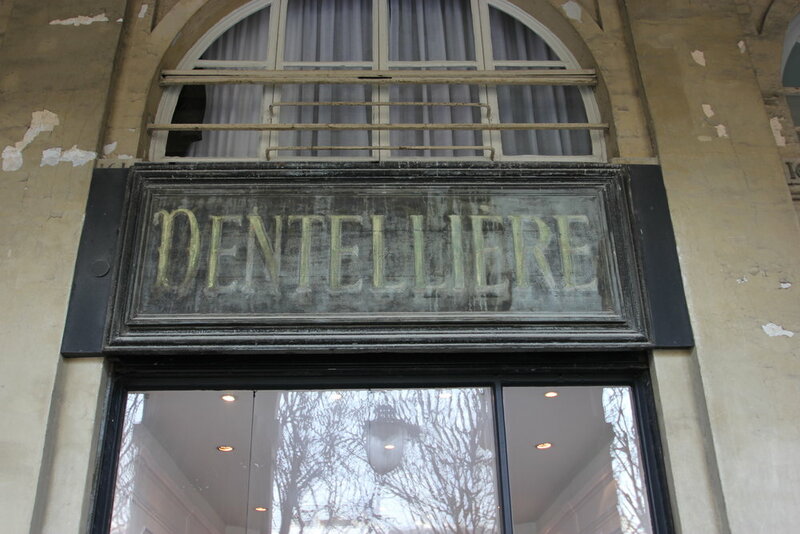 The final installment!So I will try to sum up the last bit of our trip to France in this post. 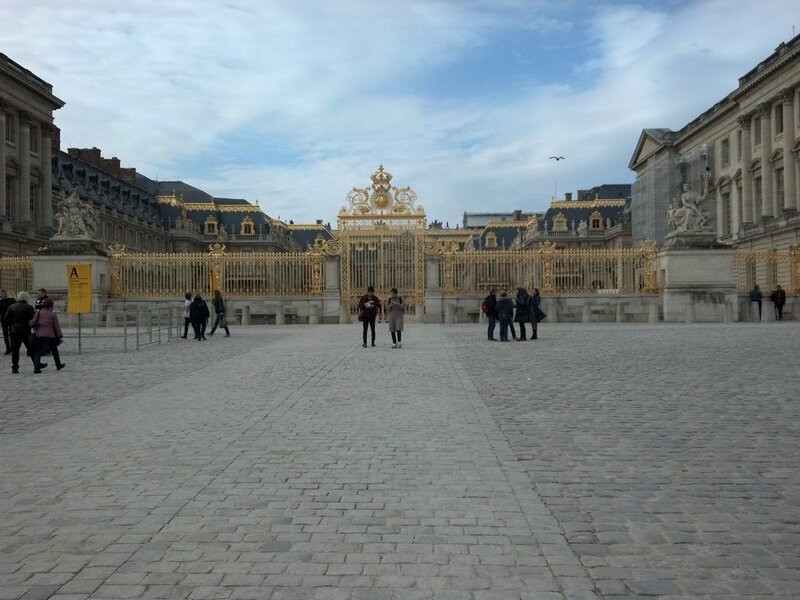 We left off with our visit to the Chateau of Versailles. The next day we began painting the marbles at the bottom of the panel. 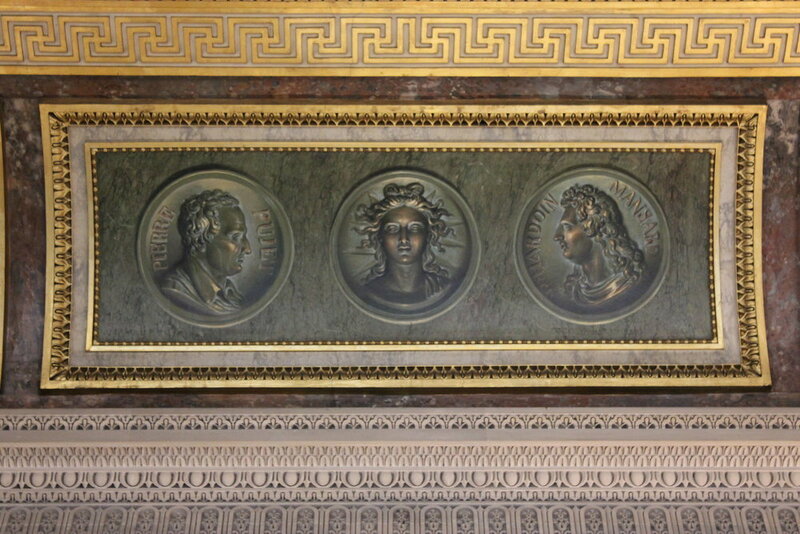 The marbles in the panel are direct references to what they used in the palace. Green Campan and Sarrancolin. My favorite is the Sarrancolin. Something about the bold rusty red and grey/white strikes me. Pierre talked about how marbles are quarried and used in decoration, how they are cut; pass cut vs. cross cut, etc. It was the hardest part of the panel for me to execute. To make it look "natural" you have to be conscious to not create 45' angles with the veins, and to make everything random. Since it was such a new marble to me and we didn't have reference photos to work from I had to rely on the demonstration by Pierre and sorta "wing it." 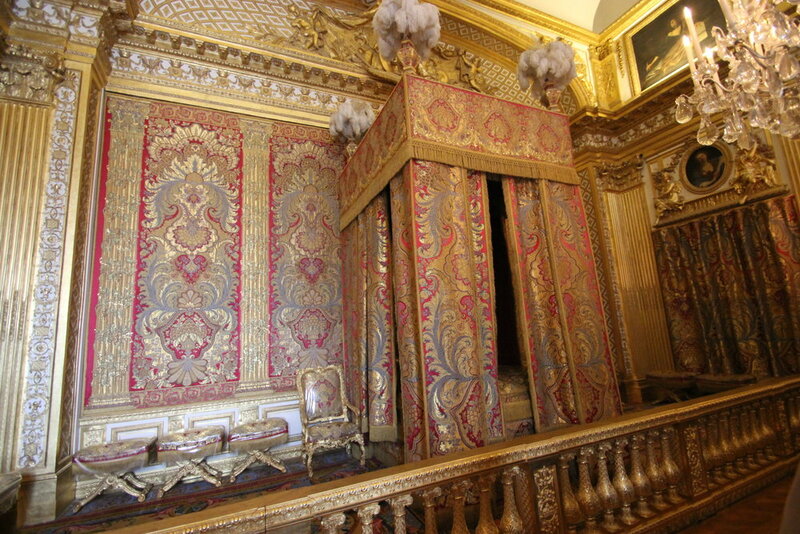 Pierre was very helpful to everyone, walking around and assisting those of us struggling.What really surprised me was how much faux there was in the palace. 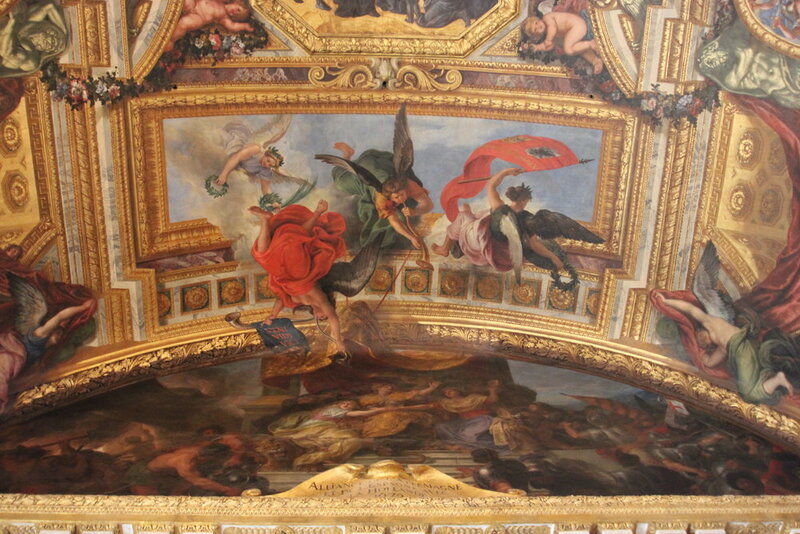 And same with the Louvre. I didn't realize that before the Louvre was a museum it was the original palace of the king before they moved out to Versailles. (Perhaps I shouldn't have fallen asleep in Art in the Dark in college?) 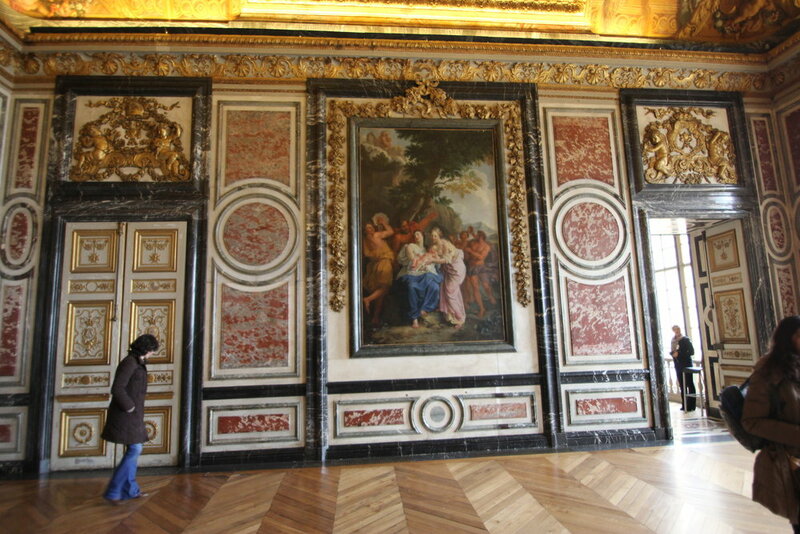 Because of the number of rulers that lived there, there are many examples of faux marble and woodgraining because each successive occupant would paint over what was there instead of ripping out and replacing elements. Thus they would paint over one type of marble with another to suit the tastes of that particular period. This is Pierre discussing with Mike how the marble here was painted over with a new type. The Louvre also seems to go on forever. When we arrived, we entered in the lower level and we could see what was the original foundation of the fortress built in the 12th century. Every monarch since then would put his own stamp on the building by adding on and redecorating. The morning of the Louvre tour, Pierre met us at the Notre Dame and took us on a foot tour of the areas within the 1st arrondissement. Everywhere we looked there were beautiful things. We walked into a church (I can't even remember which one) to see beautiful marbles, paintings, gilding, and more. 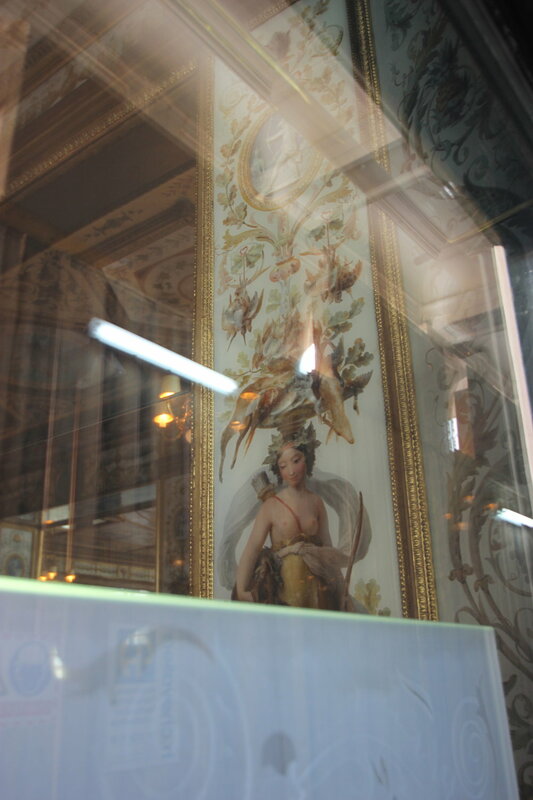 We also took a walk around the galerie de montpensier and fogged the windows at the cafe Le Grand Vefour where there were incredible paintings of grottescas and decorative elements. 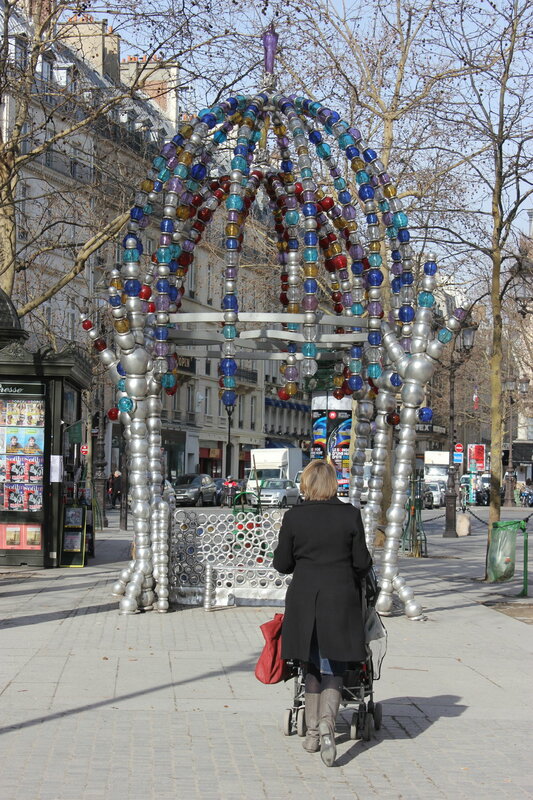 A little Bawlmer in Paris! 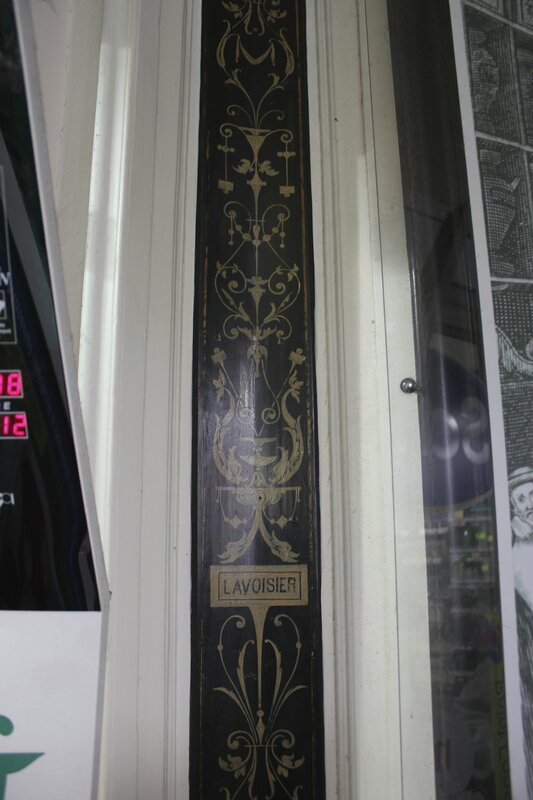 Store that has beautiful decorative painting. Randomly came across it on our walk. We made it to the Louvre around lunchtime and spent the afternoon going through various areas of the museum; the Apartments of Napoleon III, the Grand Gallery, and other areas I can now not remember their names! 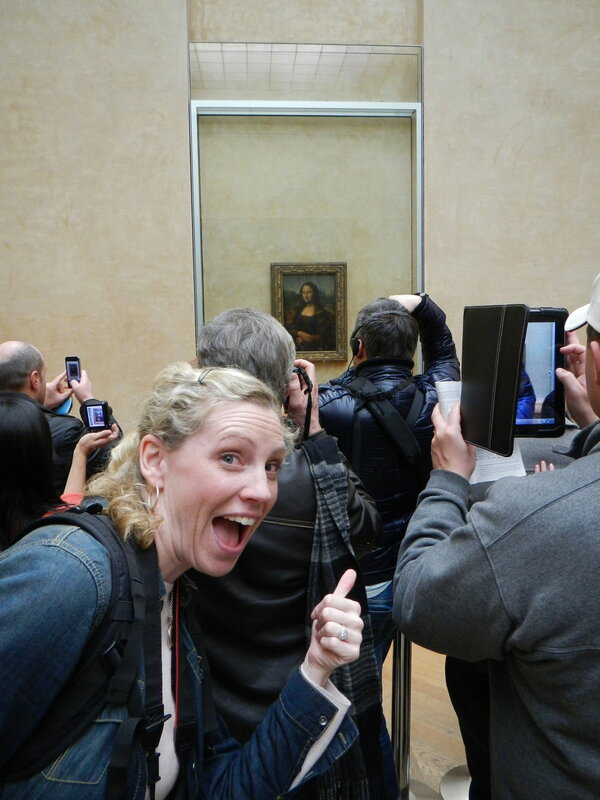 Meet getting to meet "Mona". 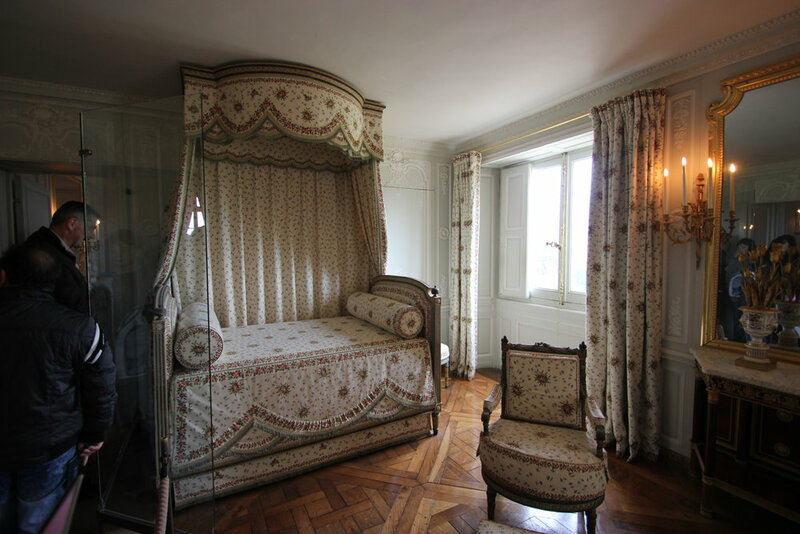 Here are a few images of our little B&B "Villa Versailles" which I highly recommend. Vanessa, the owner, is extremely accommodating and brought us homemade treats. She speaks English (whew!) and she has a dachshund named Elvis who only speaks French. View out our front door to the courtyard.Our KitchenetteThis is looking out of the school across the parking lot to our place. Its the small building with the vines all over it. One evening a friend of Pierre came to demonstrate water gilding. I got to try my hand at it, it is so very delicate. You can read more on Pierre's blog. 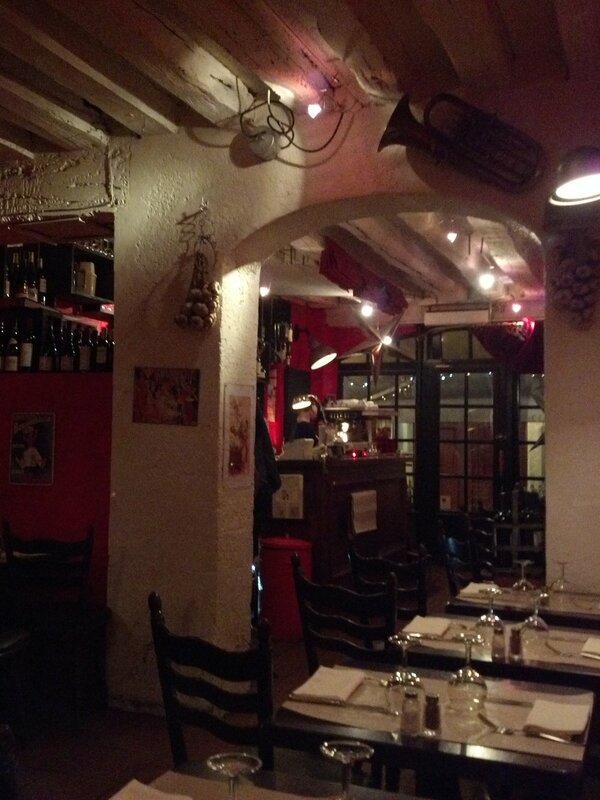 Our final dinner was at a restaurant in Versailles. The food was incredible and dogs are allowed! 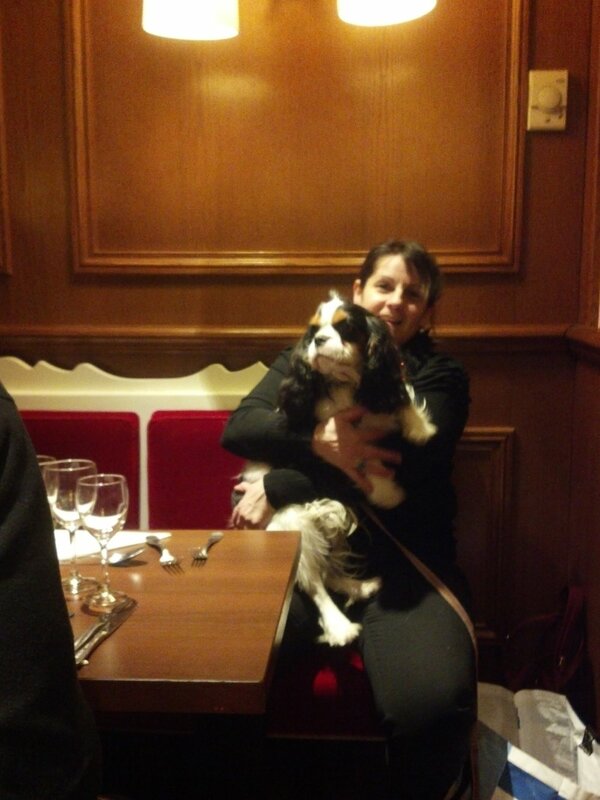 Apparently the French are huge dog lovers and the idea of not being able to bring your dog into a restaurant is unfathomable. We were all presented certificates of completion signed by both Jean and Pierre. Everyone came up one at a time for a photo op. I took the opportunity to get a kiss on the cheek like a Tour De France stage winner does from the podium girls :). It was a trip of a lifetime and we were sad to go but happy to get back to our boys and our king size bed :). Class started on Friday. I was glad to have had two days to acclimate to the time change and get to know the neighborhood. Class started off at a fast pace and only grew faster. We began with finalizing the drawing that was pounced on our panels previously. Jean discussed the "Chromatic Link", a secret and ancient method of unifying all of the elements that will be painted within the canvas. Actually its just toning the canvas. No secrets. Then we added layers of glazes to create the look of limestone, the material in which the entire niche is constructed. 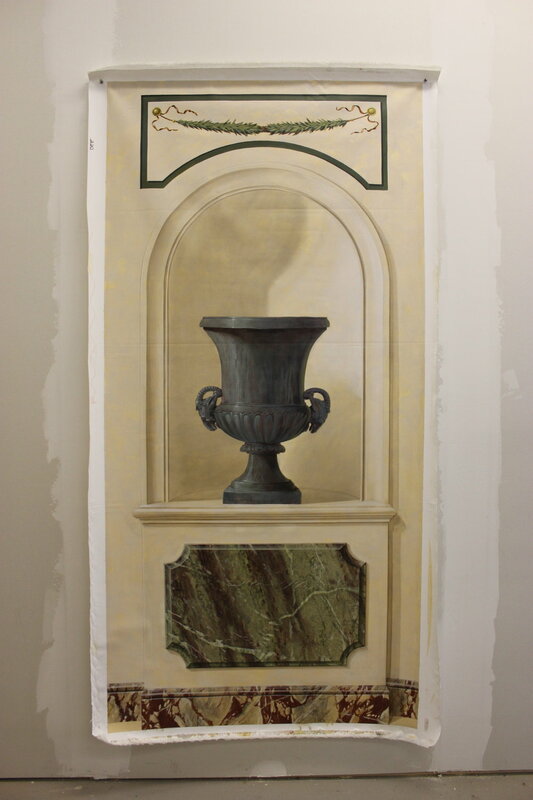 After Jean demonstrated the technique, we laid in the foundation for the ornament above the niche and moved to the background color for the urn. 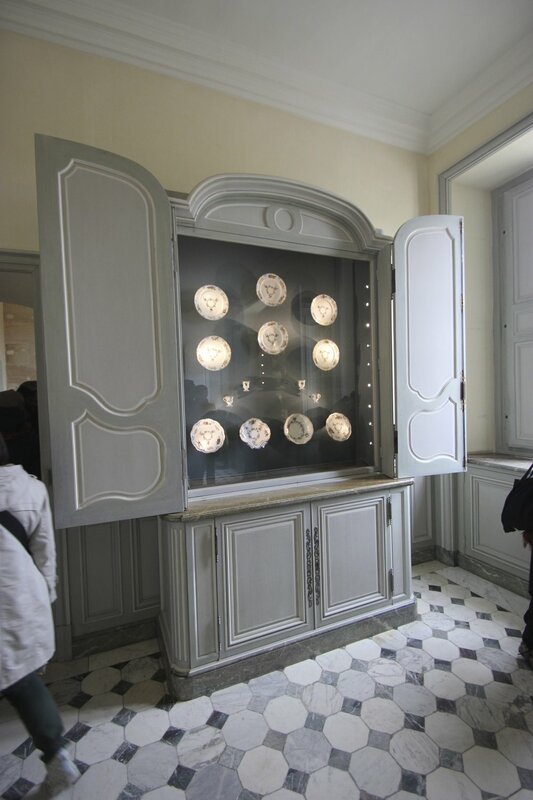 The marble panels at the bottom would come later, taught by Pierre. Then a discussion of how light affects shadows and how forms dictate their shape. My buddy Jeannie from Long Island decided to make the trip last minute, and thank goodness, it wouldn't have been the same with out her. Tre Drole! Lots of wine, baguettes, croissants, and many other French delicacies were shared. The class was full of students from around the world; Taiwan, France, Israel, US, (and California :)) a true "UN of painting!" Lunch was on our own and many people either brought food or went out and grabbed some to bring back. One day, Maddie's husband Frank bought sandwiches for everyone! There was always goodies to be had that people would bring to share, croissants, chocolates, and treats. Great conversations around the lunch table. 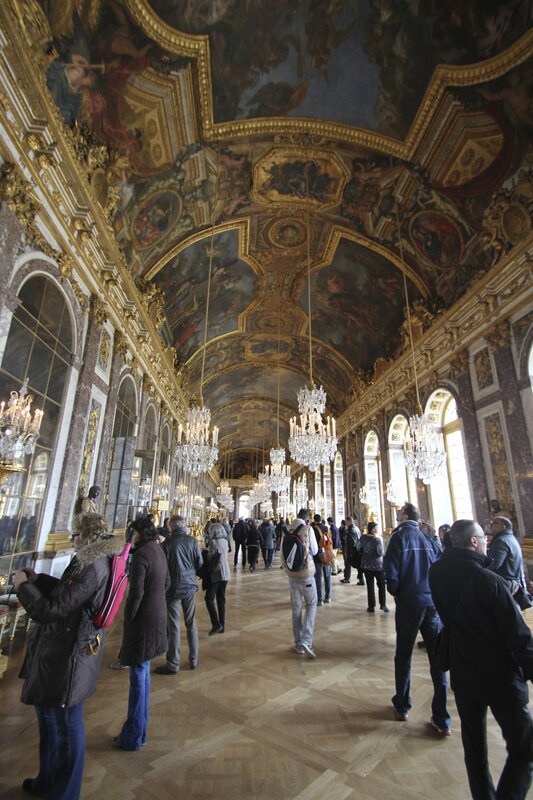 The third day we were guided by Pierre and Jean Luc on a tour of the Palace of Versailles which included the Chateau, the Grand Trianon, the Petit Trianon, and the Queen's Hamlet. I believe the word is gobsmacked. I literally couldn't believe what I was seeing. 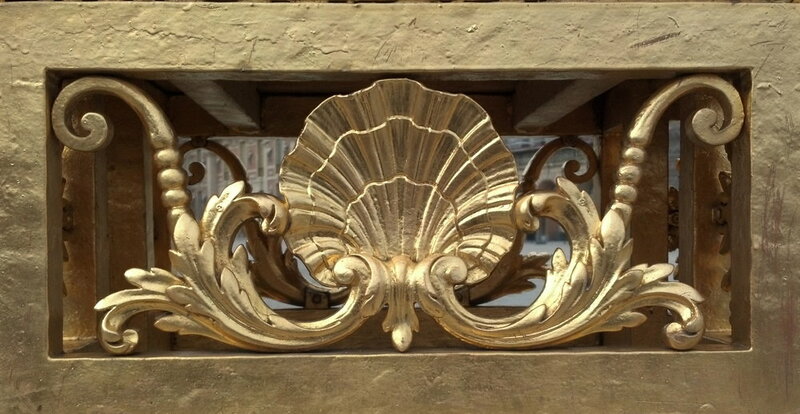 Beautiful gilding, marbles, trompe loeil... And surprisingly, a lot of the marbles were painted! Even the King had a budget! Every last inch of the place was decorated. We were treated to an unconventional tour where our "guides" pointed out details of the decorations that would not normally be on the tour. You can read some of what we learned on Pierre Finkelstein's blog. Pierre and Mikey, aka, the Crazy Frenchman and "le Stupide Américain"
More beautiful marbles, marquetry, gilding, and murals. Even the queen has to go sometimes! 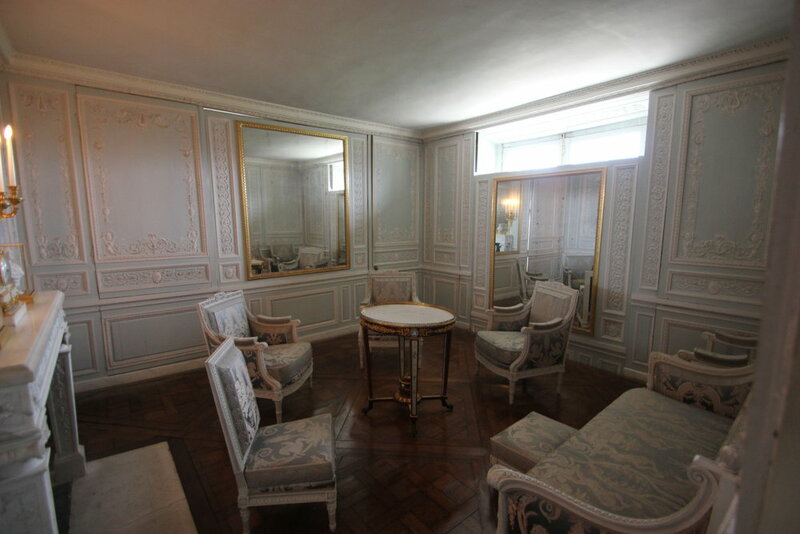 Queen's dressing room. 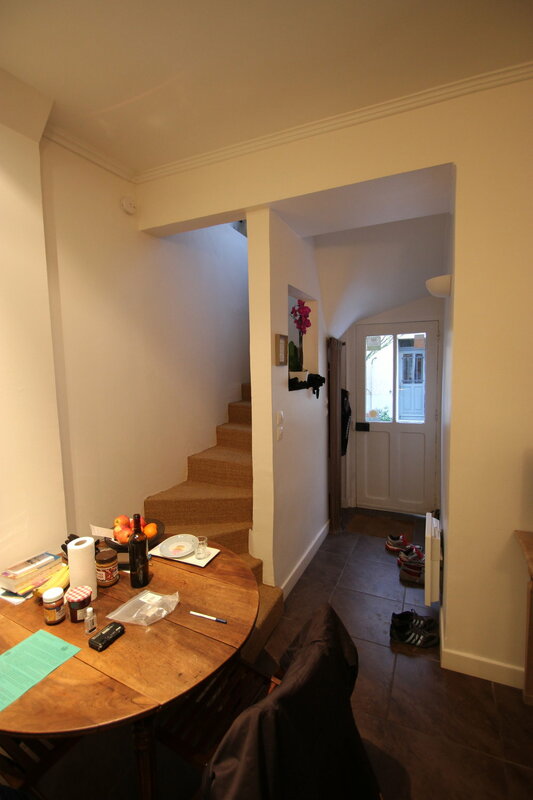 The wall panels raise and lower for privacy. Interior of the Belvedere. Look at those grottescas and ceiling!! Some of the sheep that reside on the grounds at Versailles. Up next, "French Lessons - Part 3: Mike's Adventures on the Bike"
I have been back for a week and already I feel it was a dream that I was in France. I had the opportunity to take a class with world renowned decorative arts professionals Pierre Finkelstein and Jean Luc Sable at Ecole Sable in Versailles, France. Yes, I said Versailles. <sigh>. And it was amazing. Mike came with me, he wasn't going to pass up an opportunity to travel to one of the cycling meccas of the world, even if it was in March. We flew out of Dulles outside of Washington DC on the 4th of March replete with our necessities: painting materials, guidebooks, and Mike's bike in a box. Yep. Mike brought his bike. Does that surprise you? Me neither. 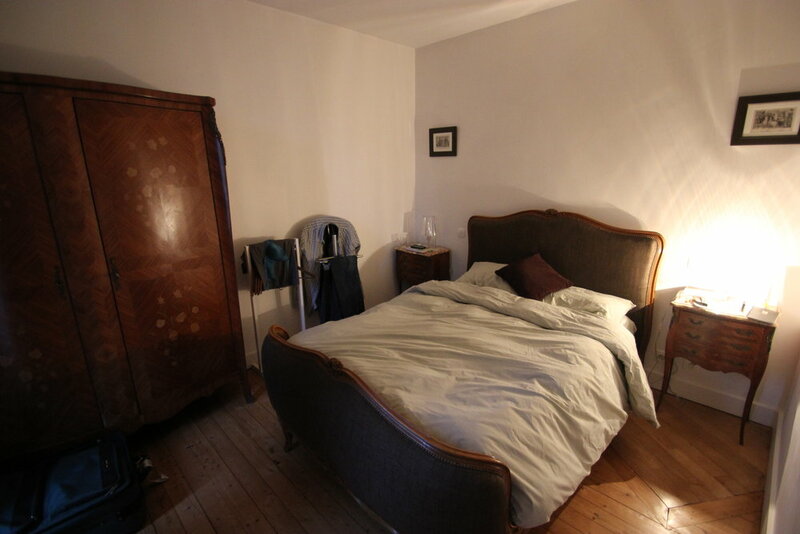 We flew into Charles De Gaulle Airport and took the RER across town to our little place I rented in Versaille. It was an ordeal to say the least. We didn't realize that we had to steel our jet lagged ears against singing and accordion playing gypsies, traipse up and down stairs trying to change trains, hoist our gear up into the train and race against the closing doors that will NOT reopen...not to mention the 1/4 mile hike from the train station to our place once we arrived at Versailles. All with our luggage. And Mike's bike box. 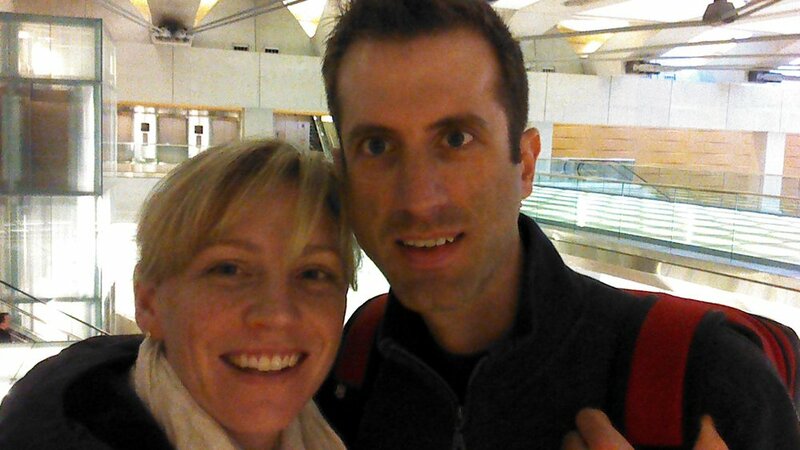 But we made it 13 hours after we left Dulles at 6pm the night before. 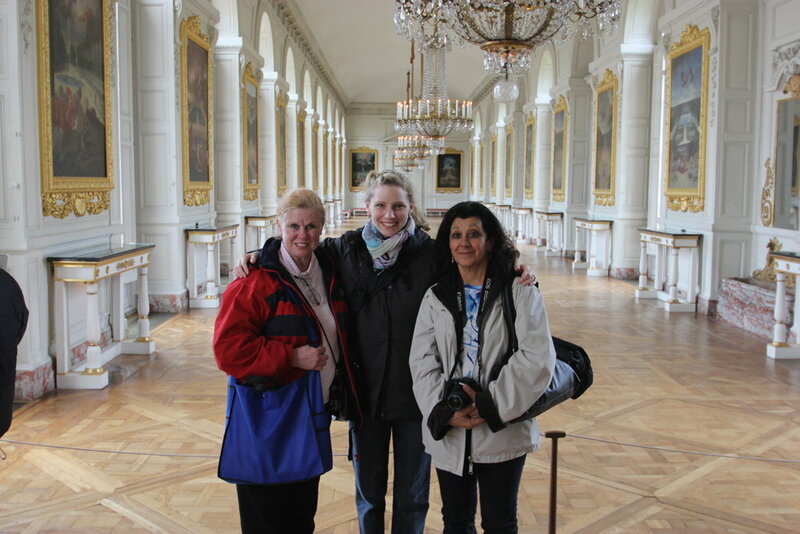 We had two days before class started so that we could explore the town of Versailles and Paris. The day we arrived (after we recovered from our train ride) we had a bite to eat at a restaurant a block from our place and then walked around the town of Versailles and were in awe of the magnitude of opulence that is the 'Chateau'. 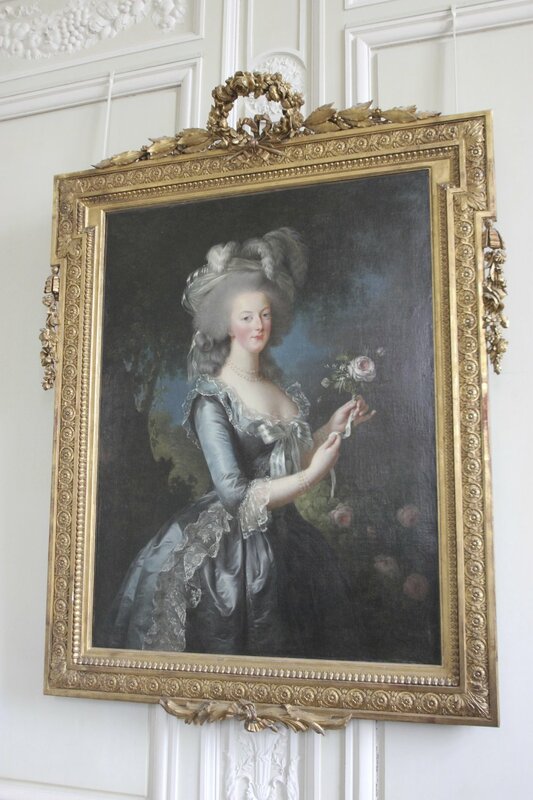 We had dinner that evening in Versailles at Chez Lazare, where they spoke English! Tres Bien! Notre Dame: I remember learning about these "flying buttresses" in art history class. Here Mike is standing in the gutter on the Champs Elysees. Next time you watch the final stage of the tour, keep an eye on when they ride this stretch. Since its the smoothest part of the street cyclists fight to get a part of the gutter which is only about 16-18 inches wide. And they go about 30 mph. 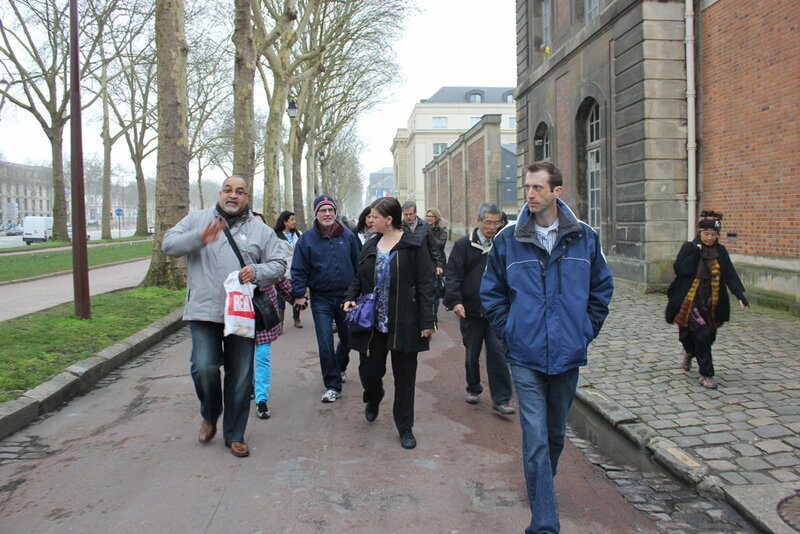 We then walked over to the Eiffel Tower and then back to the Musee de Arts Decoratif. Up next: Class starts and Mikey goes on his own "Tour de France"